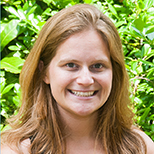 Kayleigh O’Keeffe is a Ph.D. student in the evolution, ecology and organismal biology program at the University of North Carolina at Chapel Hill. She is interested in how interactions among microbes within a host affects disease, and she explores these questions with plants and their fungal parasites. What is it about this soil that protects plants from devastating disease?